Teams that train their athletes together win on the score sheet. Today’s judges no longer score the highest skill on the mat, rather they score the majority of athletes doing the same skill well synchronized with the greatest of technique. 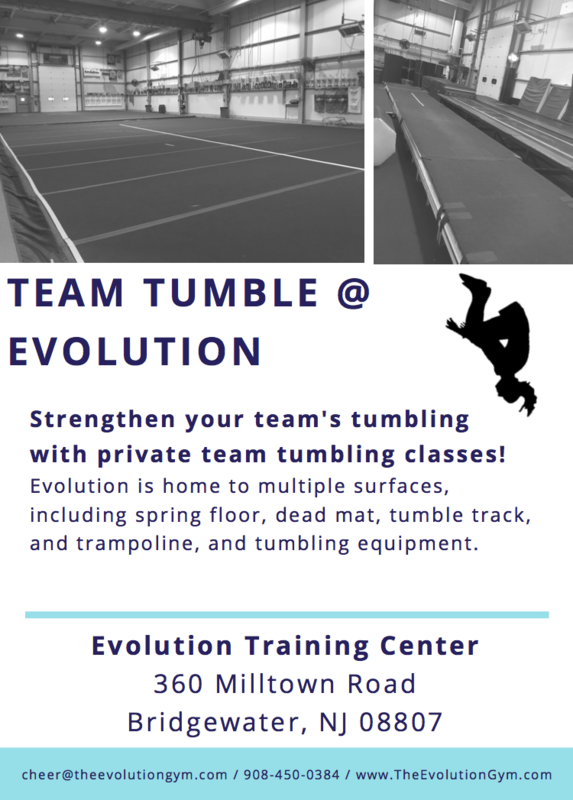 Our tumble staff specializes in developing new skills for athletes at all levels and drilling the necessary technique to drive excellence in timing and quantity of skills on the floor. Let us schedule a private class just for your athletes on a time and day that’s right for you. Due to your relationship with Evolution, your families will received specialty pricing. Shorter or longer offerings are available depending on your season and in some cases we’ll come to you! Ask about our discount for supplying your certificate of insurance. Pricing is set per athlete for a 60 minute or 90 minute tumble class.